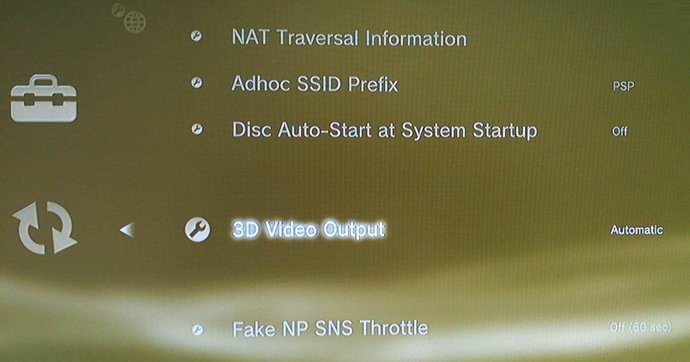 PlayStation 3 Firmware 3.20 to Add 3D Video Output Support? It seems that Sony is planing to include the much anticipated 3D support for their PlayStation 3 console in the upcoming firmware update version 3.20. Or at least there are such hints coming from from some leaked pictures of the 3.20 firmware that seems to be already in the hands of some developers. The current firmware version for PlayStation 3 is at 3.15 with still no official release date of the anticipated version 3.20, but it is expected this to happen before the official summer release of the first 3D-ready HDTVs from Sony. Prior to having a compatible 3D-ready high-refresh rate HDTV, along with the required active shutter glasses (the preferred tech for all upcoming 3D TVs) there is no point in having this feature available on the console. Also, it seems that the much anticipated Blu-ray 3D support for the PS3 console will require an additional firmware update that is supposed to be available at a later time, after the summer release of the firmware with 3D gaming capabilities, but most likely before the end of the year. If this isn’t compatible with current 3d ready hdtvs, I will poop on my ps3 and then Sony. According to the hints we got from Sony and other sources the firmware update is supposed to add some of the HDMI specifications to 1.4 mainly by adding the stereoscopic 3D support. This means that in order to work with an old 3D-ready HDTV the TV should also receive some sort of update to understand the 3D specs from HDMI 1.4. Maybe some brands will provide such updates, but I don’t suppose that all of them will do this… we’ll need to wait and see. Then there is also the matter of 120HZ+ and DLP checkerboard pattern with the active shutter glasses in theory being able to support both, but will the PS3 be able to supply them both. 2PahnCrd, if you’re talking about the 3D Ready DLP sets, if it is not (and I’m guessing it won’t be), there is an adapter box available (called 3DC-1000) that will convert from HDMI 1.4 3D to the checkerboard pattern used by 3D Ready DLP sets. I was so concerned about 1.3 HDMI working with 3D that I just said “eff it” and got a cheap 3D DLP projector for now for around $400 (VGA input only). There are too many unknowns to invest heavily for 3D. If somehow, 3D will work through component on PS3 then it’s a miracle… if not, I’m just going to wait until 3D is more prominent in the market before upgrading again. I think 3D has the potential to fail if it poo-poos on too many people, especially early adopters of 3D that buy into it first and drive the cost down for everyone later. Do even know what glasses are compatible with the PS3 3D upgrade? lol. I have an older 2008 mitsubishi dlp 3d ready tv, I am curious about this 3dc-1000 adapter and how it is gona work with cable tv 3d once avaliable, though I can say this about ps3 and 3d thru my old 1.3 hdmi port. I purchased avatar the game *ps3* and connected my thru hdmi, I put my tv on 1080p and turned on 3d ready to get glasses working. Once game starts up u just go into options and select checkboard or other form ur tv maybe. I was played 3d avatar on ps3 just last night it works fine, u can also adjust how much it sticks outa the tv or if it looks like ur looking into a window, its great I just can’t wait for the adapter so I can start watching more 3d movies. Going to see clash of the titans and how to train ur dragon in the next 2 weeks. djbd, I have a mitsubishi 3D ready tv as well. What glasses do you use? I purchased the NVIDIA 3D Vision kit and I have to use a PC to get it working. Hopefully this firmware update allows me to continue to use what I’ve already spent a small fortune on. djbd, Did you have to run the Avatar game with your PS3 through a computer system and program for DLP’s or where you able to run it with just the new PS3 update 3.2 /3.3? I have the Sammy 67″ DLP LED 3D and have the tri-d program and glasses, but don’t have the correct computer native resolution for it to be compatible with my this TV. From what I know the recent update is only a prop for the big 3D FW upgrade thise summer. I recently got XpanD 102 glasses for my DLP and they work great.